We stock a wide variety of fasteners ideal for many applications around the home, farm, business, automotive, and in industry. Most of our fasteners have a light zinc plating over steel giving a more rust resistant finish. We also sell coated and stainless products for additional rust resistance. We stock many grades of fasteners ranging from low carbon steel on up to hardened, heat treated steel. 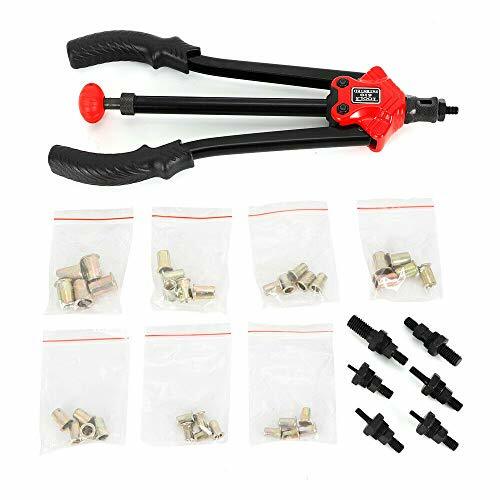 Not all fasteners are applicable for all applications so be certain to test thoroughly and get the opinion of a licensed building or certified building or structural engineer before relying on these fasteners for any situations where failure would result in damage to property or person. Made of brass plated steel. Perfect for fastening leather, fabric and other soft materials. 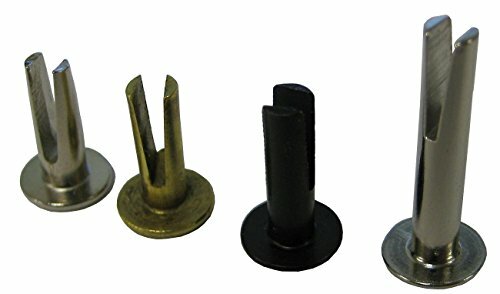 The split rivets can be used for antique furniture restoration or DIY projects. Copper plating. 20 piece package. 1 4'' to 1 2'' lengths. 5 16 to 5 32 heads. 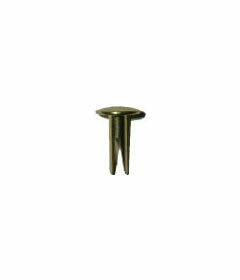 SPLIT RIVET - 1/8" DIAMETER X 5/8" LENGTH, 7/32" HEAD DIAMETER, STEEL, OVAL HEAD WITH A BRASS FINISH. (PACK OF 100). FOR PLASTICS, WOOD, FABRIC, AND OTHER SOFT MATERIALS. 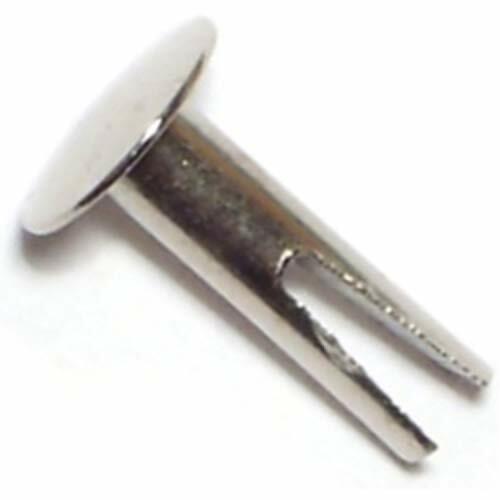 Split rivets contain a cone-shaped head and two tinelike legs. Our split rivets pierce soft materials, such as wood, light metals, leather and fibers. Possessing prong ends designed to roll back into the material, our split rivets provide a strong, smooth clinch. SPLIT RIVET - 1/8" DIAMETER X 5/16"LENGTH, 7/32", HEAD DIAMETER, STEEL, OVAL HEAD WITH A BRASS FINISH. (PACK OF 100). 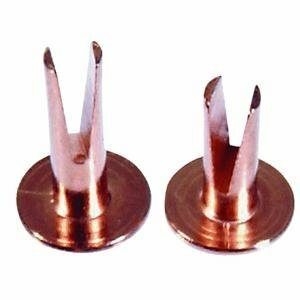 SPLIT RIVET - 1/8" DIAMETER X 3/4" LENGTH, 7/32" HEAD DIAMETER, STEEL, OVAL HEAD WITH A BRASS FINISH. (PACK OF 100). SPLIT RIVET - 1/8" DIAMETER X 8/16"LENGTH, 7/32" HEAD DIAMETER, STEEL, OVAL HEAD WITH A BRASS FINISH. (PACK OF 500). 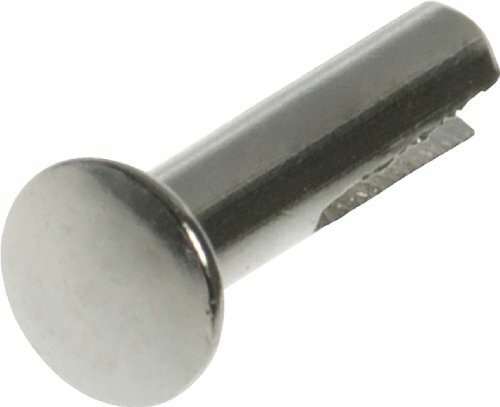 SPLIT RIVET - 1/8" DIAMETER X 5/8" LENGTH, 7/32" HEAD DIAMETER, STEEL, OVAL HEAD, NICKEL PLATED. (PACK OF 100). Use aluminum rivets for lighter weight jobs such as aluminum, fabrics, plastics, leather, etc. 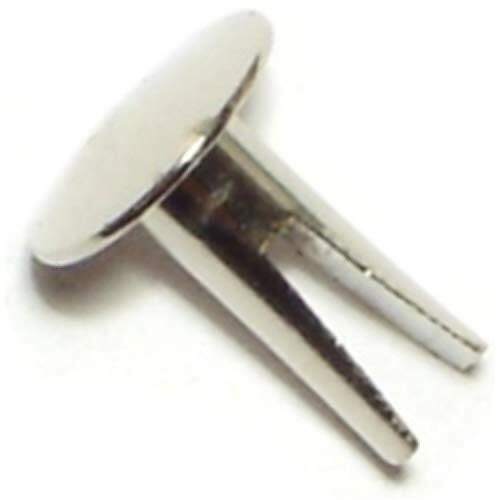 SPLIT RIVET - 1/8" DIAMETER X 1/4" LENGTH, 7/32" HEAD DIAMETER, STEEL, OVAL HEAD, NICKEL PLATED. (PACK OF 100). SPLIT RIVET - 9/64" DIAMETER X 1/2" LENGTH, 5/16" HEAD DIAMETER, STEEL, OVAL HEAD WITH A BRASS FINISH. (PACK OF 100). SPLIT RIVET - 1/8" DIAMETER X 5/16" LENGTH, 7/32" HEAD DIAMETER, STEEL, OVAL HEAD, NICKEL PLATED. (PACK OF 100).